I think everyone has certain things they don't like. For me, one of those things is going under a house with a tight crawl space. In fact, I absolutely hate it. But, sometimes you have to face your fears. I think that facing our fears can make us better in some way, once all is said and done. So, on that house I'm redoing, I needed to go under and clean out some old ductwork. 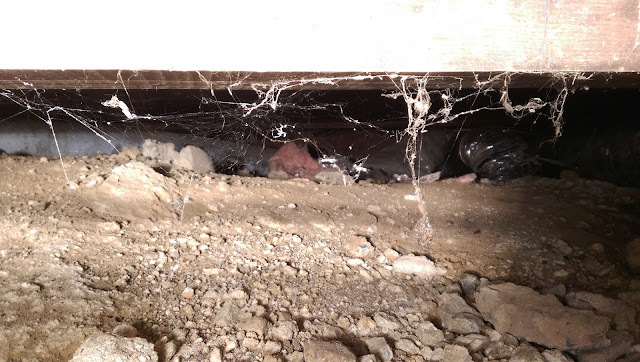 I have that thought that if I get stuck underneath the house, it's not going to be good. Naturally, I want to avoid crawl spaces. Below is one of the areas I had to go. This house has very little space that you are not flat on your belly. The flash on my camera blew out the floor joist. Shane...you are one brave dude! !